My first attempt at a Moose Christmas card was unsuccessful. Exhibit A above. I was looking for antlers or a santa hat, but all the store had was Christmas outfits for dogs. 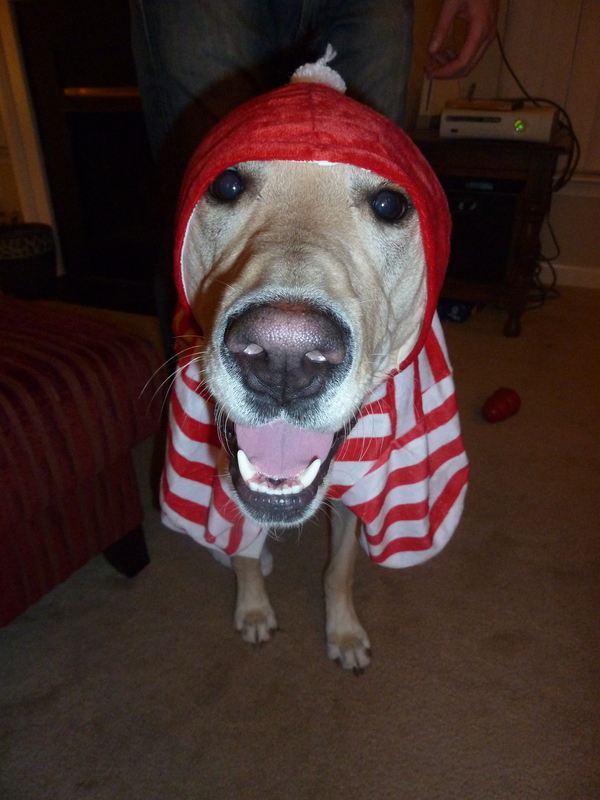 On top of that, the only thing they had in a large size was candy cane stripped doggie pajamas with a santa-esqe hood. Needless to say – it was no where near big enough for Moose! I could get it over his head but the buck stopped there. Strike One. I was going to try the same thing with my dog! I think we’ve almost worked our way around the problem but I’ll keep you posted! I always swore I’d never dress up my dog – but now I understand why people can’t resist! Thanks for checking out my blog, I LOVE yours! !